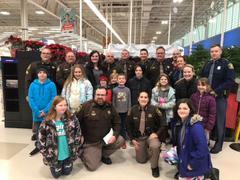 The Cass County Sheriff Richard J Behnke would like to thank all who helped make the 8th Annual Marcellus Shop with a Cop a great success. We were able to take 10 kids from Marcellus Elementary shopping at Meijer in Three Rivers to shop for their whole family and they were all given food baskets for their families as well. The people listed below are the ones that made this Shop with a Cop a success along with Three Rivers Meijer and Edward Lowe Foundation without these kind people and the volunteers who went shopping with the kids this event would have never taken place. Thanks so much for making this happen. Kids: Zhonnica Skorupa, Christopher Martin, Skylar Dempsey, Andrew Ellison, Qoie Long, Lilly Rice, Reese Stokes, Leah Bunch, Carter Farris and Sierra Bartow. Volunteers: Sheriff Richard Behnke, Undersheriff Clint Roach, Madeline Potter, Deputy MaKenzie Kreiner, Detective Kevin Cook, Sgt. Jeff Johnson, Deputy Jason Pompey, Reserve Deputy Chris Bergen, Deputy Tim Keene, Trooper Holly Higgs, Trooper Robert Mason and Leigh Feldman.